How Can You Improve Your Payment Experience For International Customers? No doubt about it, the world is shrinking—figuratively, at least. Years ago, you might never have thought you’d be selling to customers overseas. Today, global transactions are the new normal, and the menu of international merchant services continues to expand. But since what you thought yesterday might not match today’s reality, it’s possible that your payment process has some catching up to do. Let’s take a look at some signs that might indicate your international payment experience isn’t everything it could be (and should be!). The international merchant services offered by your payment provider. 1. There’s a high rate of abandonment among international shoppers. People abandon their shopping carts at the eleventh hour for all kinds of reasons, including spontaneous fires, dogs running out into the street, and chasing small children off television news programs. Those, you can’t do anything about. But there are plenty of other reasons for abandonment that have everything to do with you—and those, you need to know about. The checkout page isn’t in your language. The credit card you have isn’t supported. You can’t buy in the currency of your credit card. You’re concerned that the page doesn’t appear to be secure (there are no security logos). Too much information is required to complete the purchase. There are URL redirects from your website to the checkout page. You can tell if an international customer abandoned his or her cart by looking at the IP address the shopper came in on. If it was not a U.S. address, you know the shopper originated the shopping experience in another country. 2. Your payment success rate decreases among international shoppers (lower payment conversion rates). An analysis of your conversion rates should reveal whether a higher percentage of international shopper transactions (as opposed to domestic shopper transactions) are being declined by the issuing bank. If that’s the case, the lack of a local acquiring bank is adversely impacting your payment conversion rates. 3. You’re seeing higher-than-average refunds and chargebacks. If your checkout page isn’t localized—offering pricing and payment in whatever the shopper’s local currency is—international shoppers are forced to purchase without knowing the exact cost. If they do complete the purchase, and later discover that the actual amount is higher than expected, chances are good they’ll request a refund or, worse yet, initiate a chargeback. 4. You’re not getting a return on investment (ROI) for your marketing dollars. If you’re serious about going global, you may have already invested marketing resources in one or more countries. Surely you want to account for those efforts. And while there could be numerous reasons why you’re not seeing any sales come out of a particular country as a result of your investment, your payment process is surely among them. Now that you’re up to speed on the potentially thorny issues, the question is: What can you do about them? Does it appear in the local language of the shopper based on their location? Does it require only the minimal (essential) information to complete a sale? Asking for a phone number, for instance, is a surefire way to deter shoppers. If it’s mandatory to sign up for an account before someone can buy, that’s a turnoff for many customers as well. Are prices displayed in the currency of the shopper? Does it accept a variety of international payment methods? Does it have security logos prominently displayed? Find out which six essential metrics you should measure to maximize global ROI in this free downloadable ebook. If you answered “no” to any of the above questions, you’ve identified the points of friction that could be contributing to your high rate of abandonment by overseas customers. Your payment provider’s international merchant services should include the ability to match shoppers with the right currency. International credit card processing can be a major barrier to online sales if it’s not done right. Shoppers in Italy who want to buy something online in the U.S., for example, shouldn’t be forced to complete the purchase using U.S. dollars. If that happens, the issuing bank may view the purchase as outside the “norm” for that shopper and decline it, flagging it as potential fraud. Similarly, your payment provider should have a way to clear payments locally via international acquiring bank partners. Using the case of the Italian shopper above, an issuing bank in Europe will view the purchase as local, paving the way for a smooth transaction approval process. If, on the other hand, your payment provider doesn’t have a European acquiring bank among its partners, that purchase will be considered foreign, with a greater likelihood of decline. Cross-border transactions experience up to 20% more declines due to the challenges posed by using an out-of-country acquiring bank, so be cognizant of where your shoppers are located so you can find a payment processor who can help clear those payments locally. Accept payments from multiple countries. Accept numerous international payment methods, including mobile wallets. Accept a variety of currencies. Utilize an international merchant account to streamline the approval process. The world really is getting smaller, so it’s time to stop thinking of international checkout as being so… foreign! With the right payment provider, it becomes a natural extension of your business, with international merchant services that work behind the scenes to ensure smooth, optimal checkout experiences no matter what country your customers are in. Here at BlueSnap, we offer the most extensive set of localized options in the payment industry to provide our merchants with a robust network of local connections. Our payment platform supports sales in 180 countries, with 110 payment types, 100 currencies, and 29 languages. 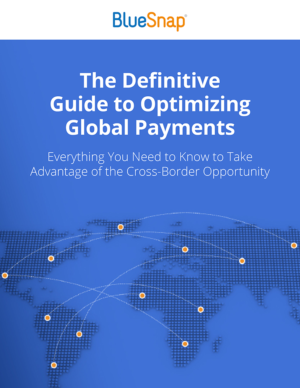 Check out our website to find out more about our global payments features, or download our free Definitive Guide to Optimizing Global Payments. It has everything you need to know to take advantage of cross-border opportunities, including ways to maximize your global ROI. Ready to cross the border? We’ll see you there!